For Spring 2019, Gucci will show in France during Paris Fashion Week. As a result, it left what felt like a gaping hole in the Milan Fashion Week schedule. The 5 days were protracted, a constant state of hoping for something to push fashion forward and to contradict our preconceived notions of what fashion can be in 2018. The week opened as it did last season, with Moncler’s Genius collaboration unveiling. The Italian luxury brand partnered with Hiroshi Fujiwara, Noir Kei Ninomiya, Simone Rocha, Craig Green, and their own 1952 diffusion, for the second season. 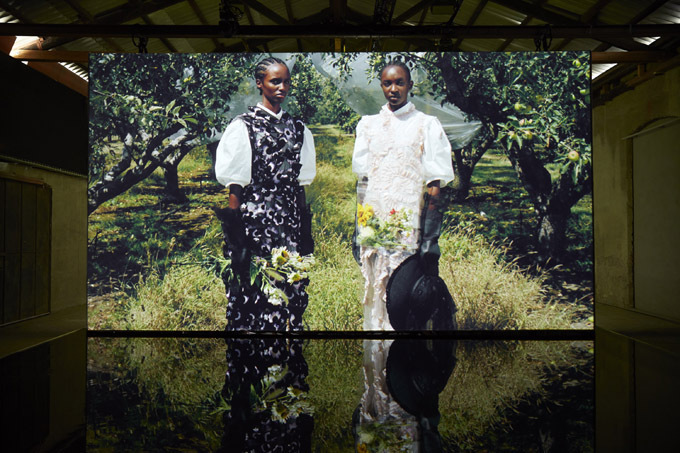 There was a fashion film, a moving installation, purpose-built Instagram bait. It wasn’t as exciting as last season—we’ve already seen these names interpret Moncler’s codes—but it diverted proceedings from the norm. Designer-on-designer collaborations have become somewhat of a new phenomenon, one which pushes away from the partnerships between H&M and Topshop with high fashion. Colmar, the 95-year-old Italian outerwear brand, called upon New York fashion renegade Shayne Oliver to ignite interest in their brand with a unisex capsule collection. It consisted of the 80s- and 90s-inspired brights with a razor-sharp focus on utility. Smart move. In recent years, Milan was punctuated by debuts at major houses. Luke and Lucie Meier’s Jil Sander continues to epitomise slow luxury, a blend of roomy tailoring and intellectual inclinations; Paul Andrew and Guillaume Meilland at Salvatore Ferragamo reinforced what they started last season. As many have noted, Ferragamo’s transformation from a product brand to a fashion brand has been quick. How they develop and sustain growth will be pivotal to acquiring a renewed sense of purpose for the Italian house. You can tell the British creative director, Paul Surridge is becoming more comfortable with the house codes at Roberto Cavalli. He compounded his minimalist streak with Cavalli animalia and athleticism, most notably, embellished cycling shorts. It looks like a happy marriage between the two. The Versace codes belong to Donatella Versace as much as they do to the house’s founder, her brother, the late Gianni Versace. Her Spring 2019 was another stance on empowered womanhood, a fitting exhibition of form and function with a splash of neon. Versace championed the return of Shalom Harlow, the 90s supermodel extraordinaire. It symbolised an appreciation for the house’s past but also its inclusive future. Jeremy Scott’s homage to the heyday of 1980s couture at Moschino was a spectacular display of someone’s love for fashion. It could be said he betrayed the meaningfulness when, everyone’s ‘favourite’ arbiters of copycat culture, Diet Prada flagged a similarity between Scott’s loose Crayola motifs and the LVMH Prize-nominated Norwegian designer Edda Gimnes. Gimnes later revealed she had a meeting with a Moschino official, sharing her sketchbooks. You make up your mind. Some other misfires: Etro evaded the controversy of the recent lawsuit, which accused the brand of discrimination, by offering a California-inspired surfer’s paradise with scuba references and breezy silhouettes; Philipp Plein hired Chris Brown and 6ix9ine to perform at his show, two men who have been arrested in the past for their mistreatment of women. His clothes were the same as always: Eurotrash delight. Emporio Armani relied on 90s styles and a Robbie Williams performance to leverage some social media mileage, Mr. Armani should consider a more thoughtful approach. 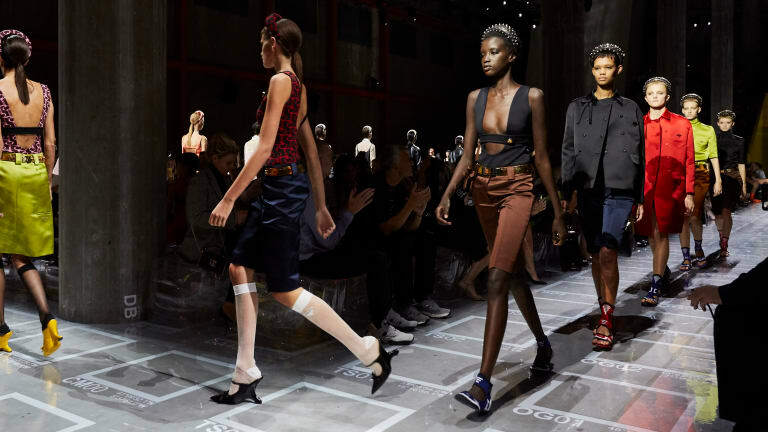 There’s always Prada to soothe our souls with its (typically) objective position in fashion: Miuccia Prada regained momentum last season with a confident strike at the heart of fashion. A Prada jolt is fashion’s equivalent to an earthquake—it’s a powerful shock to the system, a directive stance, and it has become increasingly rare. For Spring, Prada lobbied for pedal pushers, studded headbands, and more tie-dye. It recalled the early-aughts, the Carrie Bradshaw days of fashion. It was an age which made women dream. It’s about time someone signaled for a return to that kind of fashion—even if it is partly kitschy, but a soupçon of humour will take you a long way. The chaotic styling and various touchstones were Picasso-esque but wholly delectable. Francisco Risso’s Marni emerged as a key player in the Milan landscape in the past 12 months. His Sunday morning show took place in a warehouse… or could it have been a bedding store? Guests were invited to sit on beds, a soothing start to a show which heavily relied on Risso’s intuition. He manipulated classicism with scarf prints and deconstructed tailoring. The show notes likened the design process to a recipe and Risso its chef, sampling different permutations. The collection was a panoply of colour, texture, and pattern, with an inherent childlike sensibility and the associated urge for discovery. It feels instinctive but intuitive, haphazard but considered. The clothes can be as playful and lively as your average 2-year-old but designed for adult women. It’s taken Risso a couple seasons to get into the swing of things and this may have veered a little too into his Prada days but he’s starting to balance his signatures with Marni's. The issue underscoring Milan Fashion Week is in the designers' preoccupation with the past. Whether it’s anachronisms like passé styles or Robbie Williams, some of the Italian-based brands struggle to push things forward. Seeking solace in the 1990s or the 2000s is fine, so long as you can contribute something to the narrative. Otherwise, what’s the point? Few names—Prada, Versace, Marni, the Meier’s at Jil Sander—articulated the future of fashion through the lens of the past. Even sportswear brand Colmar knew how to revive brand intrigue. To step forward, one must look backwards, not move backwards. Milan’s designers should take note.